Limited-edition version "shines under the spotlight"
Korg's Kronos club has a Platinum member. NAMM 2016: Korg is bringing its Kronos workstation back into the limelight with a limited edition Platinum version of the 88-key model. 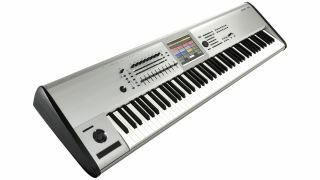 Specs are the same as the standard 88-note Kronos, but this platinum-coloured version comes with dark side panels and - in Korg's words - "emanates a special aura of superior quality". We're also told that it "shines beautifully on stage under the spotlight". The Kronos-88 Platinum will be available in April priced at £3478. Find out more on the Korg website.